Ever since the news came out on September 22 of last year that a team of researchers in Italy had clocked neutrinos traveling faster than the speed of light, the physics world has been resounding with the potential implications of such a discovery — that is, if it were true. The speed of light has been a key component of the standard model of physics for over a century, an Einstein-established limit that particles (even tricky neutrinos) weren’t supposed to be able to break, not even a little. Now, according to a breaking news article by Edwin Cartlidge on AAAS’ ScienceInsider, the neutrinos may be cleared of any speed violations. “According to sources familiar with the experiment, the 60 nanoseconds discrepancy appears to come from a bad connection between a fiber optic cable that connects to the GPS receiver used to correct the timing of the neutrinos’ flight and an electronic card in a computer,” Cartlidge reported. 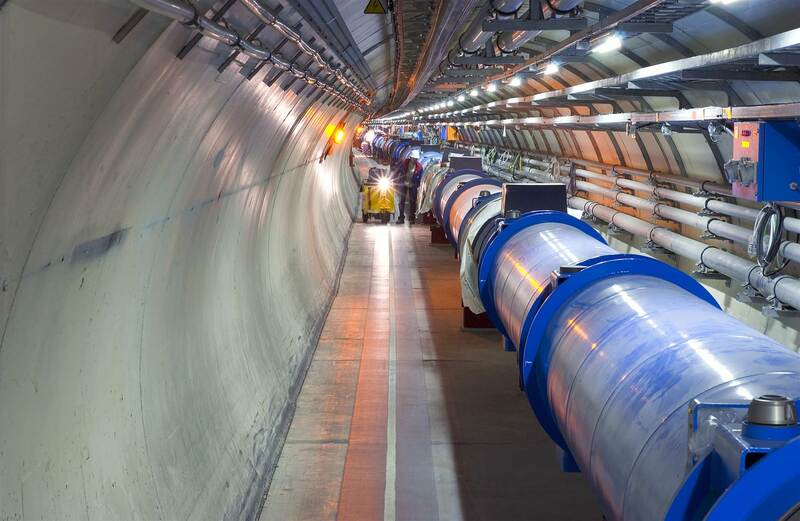 The original OPERA (Oscillation Project with Emulsion-tRacking Apparatus) experiment had a beam of neutrinos fired from CERN in Geneva, Switzerland, aimed at an underground detector array located 730 km away at the Gran Sasso facility, near L’Aquila, Italy. Researchers were surprised to discover the neutrinos arriving earlier than expected, by a difference of 60 nanoseconds. This would have meant the neutrinos had traveled faster than light speed to get there. Repeated experiments at the facility revealed the same results. When the news was released, the findings seemed to be solid — from a methodological standpoint, anyway. Shocked at their own results, the OPERA researchers were more than happy to have colleagues check their results, and welcomed other facilities to attempt the same experiment. Repeated attempts may no longer be needed. Once the aforementioned fiber optic cable was readjusted, it was found that the speed of data traveling through it matched the 60 nanosecond discrepancy initially attributed to the neutrinos. This could very well explain the subatomic particles’ apparent speed burst. Case closed? Well… it is science, after all. See the original OPERA team paper here. New test results are in from OPERA and it seems those darn neutrinos, they just can’t keep their speed down… to within the speed of light, that is! A report released in September by scientists working on the OPERA project (Oscillation Project with Emulsion-tracking Apparatus) at Italy’s Gran Sasso research lab claimed that neutrinos emitted from CERN 500 miles away in Geneva arrived at their detectors 60 nanoseconds earlier than expected, thus traveling faster than light. This caused no small amount of contention in the scientific community and made news headlines worldwide – and rightfully so, as it basically slaps one of the main tenets of modern physics across the face. Of course the scientists at OPERA were well aware of this, and didn’t make such a proclamation lightly; over two years of repeated research was undergone to make sure that the numbers were accurate… as well as could be determined, at least. And they were more than open to having their tests replicated and the results reviewed by their peers. In all regards their methods were scientific yet skepticism was widespread… even within OPERA’s own ranks. One of the concerns that arose regarding the discovery was in regards to the length of the neutrino beam itself, emitted from CERN and received by special detector plates at Gran Sasso. Researchers couldn’t say for sure that any neutrinos detected were closer to the beginning of the beam versus the end, a disparity (on a neutrino-sized scale anyway) of 10.5 microseconds… that’s 10.5 millionths of a second! And so in October, OPERA requested that proton pulses be resent – this time lasting only 3 nanoseconds each. The results were the same. The neutrinos arrived at Gran Sasso 60 nanoseconds earlier than anticipated: faster than light. The test was repeated – by different teams, no less – and so far 20 such events have been recorded. Each time, the same. What does this mean? Do we start tearing pages out of physics textbooks? Should we draw up plans for those neutrino-powered warp engines? Does Einstein’s theory of relativity become a quaint memento of what we used to believe? Hardly. Or, at least, not anytime soon. OPERA’s latest tests have managed to allay one uncertainty regarding the results, but plenty more remain. One in particular is the use of GPS to align the clocks at the beginning and end of the neutrino beam. Since the same clock alignment system was used in all the experiments, it stands that there may be some as-of-yet unknown factor concerning the GPS – especially since it hasn’t been extensively used in the field of high-energy particle physics. In addition, some scientists would like to see more results using other parts of the neutrino detector array. Of course, like any good science, replication of results is a key factor for peer acceptance. And thus Fermilab in Batavia, Illinois will attempt to perform the same experiment with its MINOS (Main Injector Neutrino Oscillation Search) facility, using a precision matching OPERA’s. MINOS hopes to have its independent results as early as next year. The recent news from the Oscillation Project with Emulsion-tRacking Apparatus (OPERA) neutrino experiment, that neutrinos have been clocked travelling faster than light, made the headlines over the last week – and rightly so. There are some very robust infrastructure and measurement devices involved that give the data a certain gravitas. The researchers had appropriate cause to put their findings up for public scrutiny and peer review – and to their credit have produced a detailed paper on the subject, beyond just the media releases we have seen. Nonetheless, it has been reported that some senior members of the OPERA research team declined to be associated with this paper, considering that it was all a bit preliminary. After all, the reported results indicate that the neutrinos crossed a distance of 730 kilometres in 60 nanoseconds less time than light would have taken. But given that light would have taken 2.4 million nanoseconds to cross the same distance – there is a lot hanging on such a proportionally tiny difference. It would have been a different story if the neutrinos had been clocked at 1.5x or 2x light speed, but this is more like 1.0025x light speed. And it would have been no surprise to anyone to have found the neutrinos travelling at 99.99% of light speed, given their association with the Large Hadron Collider. So, confirming that they really are exceeding light speed, but only by a tiny amount, requires supreme confidence in the measuring systems used. And there are reasons to doubt that there are grounds for such confidence. The distance component of the speed calculation had an error of less than 20 cm out of the 730 kilometres path, or 0.00003% if you like, over the data collection period. That’s not much error, but then the degree to which the neutrinos are claimed to have moved faster than light isn’t that much either. But the travel time component of the speed calculation is the real question mark here. The release time of neutrinos from the source could only be inferred as arising from a 10.5 microsecond burst of protons from the CERN Super Proton Synchrotron (SPS) – fired at a graphite target, which then releases neutrinos towards OPERA. The researchers substantially restrained the potential error (i.e. 10.5 microseconds) by comparing the time distributions of SPS proton release and neutrino detection at OPERA over repeated trials, to give a probability density function of the time of emission of the neutrinos. But this is really just a long-winded way of saying they could only estimate the likely travel time, more or less. And the dependence on GPS satellite links to time stamp the release and detection steps represents a further source of potential measurement error. Some of the complex infrastructure required to infer the travel time of neutrinos across the OPERA experiment. Credit Adam et al. It’s also important to note that this was not a race. The 730 kilometre straight-line pathway to OPERA is through the Earth’s crust – which is virtually transparent to neutrinos, but opaque to light. The travel time of light is hence inferred from measuring the path distance. So it was never the case that the neutrinos were seen to beat a light beam across the path distance. The real problem with the OPERA experiment is that the calculated bettering of light speed is a very tiny margin that has been measured over a relatively short path distance. If the experiment could be repeated by firing at a neutrino detector on the Moon say, that longer path distance would deliver more robust and more convincing data – since, if the OPERA effect is real, the neutrinos should very obviously reach the Moon quicker than a light beam could. Until then, it all seems a bit premature to start throwing out the physics textbooks. Adam et al Measurement of the neutrino velocity with the OPERA detector in the CNGS beam. A contrary view – including reports than not all the Gran Sasso team are on board with the FTL neutrino idea.